Deadly clashes erupted in Cairo on Sunday as pro-Morsi marches protesting against the military headed to Tahrir Square, where thousands were celebrating the 40th anniversary of the 1973 war against Israel and voicing support for the army. Confrontations also took place outside the capital, with the death toll rising to 51. At least 268 were injured in the melee. 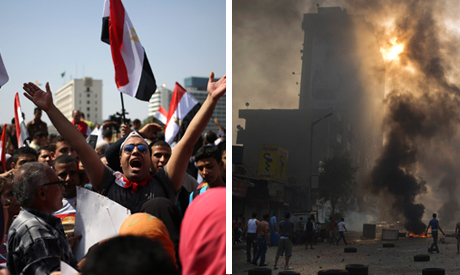 Egypt's Interior Ministry said it arrested 423 people in Cairo and Giza during clashes. The National Alliance to Support Legitimacy, a coalition of Islamist forces supporting deposed president Mohamed Morsi, claimed that at least 11 protesters had been killed in clashes with security forces in Ramses Street in central Cairo. Armoured police vehicles approached the site firing teargas to disperse the crowds. MENA also reported that gunshots were heard amidst the clashes in Ramses. Backers of Morsi's Muslim Brotherhood have staged thousand-strong marches in several parts of Cairo, Giza and other governorates. Rallies took a violent turn in central Cairo's Garden City and Giza's Dokki district, where police fired rounds of teargas after local residents clashed during pro-Morsi protests heading towards Tahrir, eyewitnesses and Ahram Online reporters said. The sound of heavy gunfire was later reported. Politician and former presidential candidate Bothaina Kamel told Aswat Masriya that she was physically assaulted and her car windows were smashed by pro-Morsi demonstrators while she was driving through Dokki on Sunday. In Giza's Manial district, where battles have become recurrent between residents and pro-Morsi protesters of late, clashes erupted between demonstrators and security forces. Two police vehicles were reportedly torched amid the chaos. In Delga - a town south of Cairo held by Islamists until security forces raided it last month - a Brotherhood supporter was killed and at least three injured as a pro-Morsi march clashed with police. Protesters hurled stones at security officers near a police station, and officers responded with live fire. General Sayed Shafiq, deputy interior minister, said later in the day that the security situation is "under control" in Cairo. Almost two dozen Islamists were arrested early on Sunday in northeast Cairo while marching towards the Rabaa Al-Adawiya area, which security forces raided in mid-August to disperse a sizeable extended sit-in by Morsi loyalists, leaving hundreds dead. The area, along with other major squares, has been sealed off to protesters since the police crackdown. In Cairo's Mohandeseen district, thousands of Morsi backers marched through the area, many flashing the four-finger Rabaa sign and chanting anti-army slogans, reported Ahram Online's Sherif Tarek. Flexing its muscles, the National Alliance to Support Legitimacy urged followers to converge on Tahrir Square, the epicentre of the 2011 uprising and 2012 demonstrations against Morsi's rule. However, its ability to muster large crowds has tailed off as security forces have mounted a crackdown on Islamists, arresting hundreds of members and allies including Morsi himself. Also, police and army troops barred Islamist marches from reaching the capital's major squares, as army jets and F-16 fighters hover in formations over Cairo, Alexandria and several other cities. A short distance away from the Ramses clashes in the flashpoint Tahrir Square in downtown Cairo, an Ahram reporter said people were queuing to stream into the area to celebrate the national holiday. There was a celebratory atmosphere, but security is evident. Protesters, many clad in T-shirts bearing the photo of army chief General Abdel Fattah El-Sisi or holding his picture, have converged on the square in their thousands as patriotic songs boom from loud speakers. People walk through metal detectors and are thoroughly searched by police and army personnel as they enter the square, with only two entrances open. All other routes in are sealed off, according to Ahram Online's Osman El-Sharnoubi. Egypt's army traditionally celebrates the October war against Israel – which eventually led to the recovery of the Sinai Peninsula – each year with military performances and flyovers, and the day is a public holiday. Meanwhile, other pro-military rallies have taken to the streets in cities that earlier witnessed clashes, including Alexandria, Ismailia, Al-Mahalla and Beni Suef. Marches in support of the army also took place in Damietta, Sohag, Aswan, Kafr El-Sheikh, Port Said, Mahalla and other governorates. Demonstrators carried Egyptian flags, posters of army commander-in-chief El-Sisi and played national songs. At Cairo's air defence stadium, celebrations for the war anniversary, organised by Egypt's armed forces have started, attended by army commander-in-chief El-Sisi, interim President Adly Mansour and former head of the Supreme Council of Armed Forces (SCAF) Hussein Tantawi. Gihan El-Sadat, widow of ex-President Anwar El-Sadat, during whose presidency Egypt staged the 6 October attack against Israel, was also present. The celebrations include a play on Egypt's history and contemporary period as well as interludes from various singers including Egyptian artists Angham, Ihab Tawfik, and Lebanese diva Nancy Agram. The confrontation had occured when the march approached a central square where pro-military crowds were celebrating the national holiday. Skirmishes also took place in Ismailia, Beheira governorate and in Aswan in the south of the country. Egypt has been gripped by prolonged violence since the overthrow of Morsi on 3 July after mass demonstrations against his turbulent year in office. The ouster of the former elected president, which was part of a roadmap agreed upon by many political groups and the armed forces, has enraged Islamists who have denounced the move as a violation of democratic "legitimacy." Hundreds were killed on 14 August when security forces moved to forcibly disperse two protest camps set up by Morsi loyalists in Cairo and Giza, unleashing days of violent turmoil and deepening polarisation. Militants elsewhere have taken up arms against the state. The army has been battling an insurgency in the Sinai Peninsula, adjoining Israel and the Palestinian Gaza Strip, where Islamist militants have mounted almost daily attacks on security and army targets, killing dozens. Welldone.God bless Egyipt forever. Peace be upon Egyiptians. WISH YOU WELL AND SUCCSES. The enemy of Egyipt is the enemy of islam if realy this word means peace. The enemy of egyipt is the enemy of freedom. Rise up egyipt. Good,Bravo! go on...massacre the people. Long live the army...Rabit before the Jews...lions before the people.